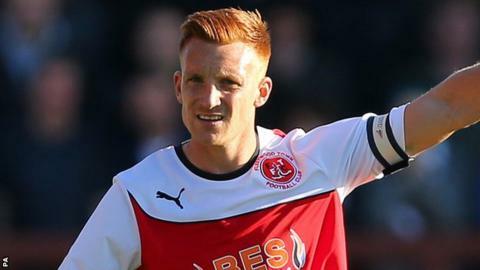 Fleetwood captain Mark Roberts's late header earned his side a draw against fellow play-off hopefuls Peterborough. The former Stevenage defender placed a bullet header into the bottom corner from Conor McLaughlin's pinpoint cross. Posh had taken the lead midway through the second half when Jon Newell capitalised on a period of pressure to curl in a sublime strike. After Roberts's equaliser, Jamie Proctor almost won it for the hosts but fired his effort against the woodwork. A point apiece means Peterborough drop to 10th in League One, two points off the play-off spots, while Fleetwood remain in 11th behind Posh on goal difference. Match ends, Fleetwood Town 1, Peterborough United 1. Second Half ends, Fleetwood Town 1, Peterborough United 1. Corner, Fleetwood Town. Conceded by Harry Beautyman. Ashley Hunter (Fleetwood Town) wins a free kick on the left wing. Attempt saved. Marcus Maddison (Peterborough United) right footed shot from the centre of the box is saved in the bottom right corner. (Fleetwood Town) wins a free kick in the defensive half. Jamie Proctor (Fleetwood Town) hits the bar with a right footed shot from the centre of the box. Stephen Crainey (Fleetwood Town) wins a free kick in the attacking half. Foul by Shaun Brisley (Peterborough United). Goal! Fleetwood Town 1, Peterborough United 1. Mark Roberts (Fleetwood Town) header from very close range to the bottom left corner. Assisted by Conor McLaughlin with a cross. Substitution, Fleetwood Town. Stephen Dobbie replaces Nick Haughton. Substitution, Fleetwood Town. Ashley Hunter replaces Gareth Evans. Attempt missed. Gareth Evans (Fleetwood Town) left footed shot from outside the box is close, but misses to the right. Hand ball by Christian Burgess (Peterborough United). Attempt missed. Harry Beautyman (Peterborough United) right footed shot from outside the box is high and wide to the right. Attempt missed. Nick Haughton (Fleetwood Town) right footed shot from the right side of the box is close, but misses to the left. Goal! Fleetwood Town 0, Peterborough United 1. Joe Newell (Peterborough United) right footed shot from the left side of the box to the top right corner. Attempt missed. Harry Beautyman (Peterborough United) right footed shot from outside the box is close, but misses to the left. Substitution, Peterborough United. Jack Payne replaces Jermaine Anderson.